Kita lupakan pasal liga malaysia yang hangat diperkatakan. Kita ada misi yang penting hari ini. Perlawanan diantara Malaysia U23 bertemu Negara Nepal pada hari ini. Pertarungan di MBPJ KELANA JAYA pukul 5.15 petang. Kalau nak masuk, kena beli ticket lah pulak rm 20 hengget. Untuk makluman anda semua, TIADA LIVE disiarkan dalam siaran langusung ini, baik ASTRO mahupun RTM (sukan terbaik hanya di rtm). Kalau ikutkan ranking, memang diakui malaysia bawah sedikit dari nepal nih. Lupakanlah pasal ranking, kalau nak dibandingkan dengan perlawanan dengan australia tempoh hari. Nantikannya ulasan jer la ada sikit-sikit. Bantuan dari rakan yang menetap disana. Tunggu!! Kosong jer orang. baru pukul 4. Belum sampai lagi orang. Minit pertama: Perlawanan sudah bermula! Lineup malaysia U23: Line-up: izham, mahali, amer, syazwan, fandi, syahrul, guru, gary, kecik, nazmi, baddrol (c). Minit ke 3' : Malaysian U-23 team is taking the ball possession. Nepal team is playing wall passes between players. Minutes 4: Foul kick to Nepal. poo kick by Jagjet Shrestha as Malaysian defenders easily control the ball. Nepalese team players are playing short passes. Minutes 6: Another attack from Malaysian side, Nazmi kicks long kick but Nepal goalie, Kiran Chemzong dives to his left to save the ball. Minutes 7: Malaysian team is pressing hard. Foul by Santosh Sahukhala, diving tackle but referee whistles for a foul kick. Minutes 9: Malaysia makes another attemp from the left flank, Badfrol shoots powerful shot but the ball goes too wide from the pole. Minutes 10: Nepal National team has not started well against the Malaysian team. the score is 0-0 draw. Minutes 12: Good cross by Baddrol, Biraj Maharjan is marking well to Wan Zaharul, good defensive game, but the ball goes wide from the target. Minites 15: Oh hoooo! Good save by Rohit Chand from goal line.....Could be first goal for Malaysia, Baddrol crosses the ball from left flank, goalie, Kiran comes forward but the ball is cleared by Rohit chand. Minutes 22: Oh hooooo!!!!! Malaysia on attack! Guru sammy gives through pass to Baddrol, who beats off side trap, one vs one position with goalie Kiran chemzong, Baddrol slips while kicking the ball and Deepak Bhushal clears the ball from Danger zone. Minutes 26: Anil Gurung looks injured. He is fine after some minor treatment. Nepal National 0 Malaysia Olympic team 0. Minutes 27: Biraj Maharjan fouls on Nazmi, free kick to Malaysia, good kick by Nazmi but Nepal striker, Anil Gurung goes deep to clear the ball. Too defending game by Nepalese team. Minutes 28: Foul kick to Nepal. Santosh Sahukhala is fouled by Md Swjyan, Jagjeet Shrestha gives a poor pass to Bhola Silwal , forest of legs sandwiches him but referee whistles for a foul. Minites 30: Santosh Sahukhala is fouled by Syahrul, referee whistles for a kick. Oh ho.. poor combination between Nepalese players, wastes the kick by passing to Malaysian team. Minutes 32: Oh hoo Counter move, Sagar Thapa fails to challenge Syahrul, oh hoooooooooooooo! good save by Nepal goalie, Kiran Chemzong, One vs one....Lovely save!! Minutes 33: Nepal (0) Vs Malasia (0). MInutes 35: Another chance for Malaysia... what a poor combination between defenders and goalkeepers, total luck to Nepal, Syazrul shoots the ball out from the pole inches wide!!! Minutes 38: There is another chance for Malaysia Olympic team, Baddrol Bakhtiar shoots the ball little high from the Nepal D-box, Nepalese defenders looking under pressure. Both teams are goalless. Minutes 46: Second Half Starts. Bharat Khawas IN, Jagjeet Shrestha OUT - Nepal. Minutes 47: Foul by Anil Gurung to Mahali, referee whistles for a foul kick. Mohd Fandi dribble pasts two defenders but Rohit Chand clears the ball from just outside the D-box. Minutes 49: Oh hooooo! no marking at all to Malaysian players, Free shot chance to Abdul, powerful shot from 20 yard distance but the ball goes little above from the bar. Minutes 52: Rohit Chand is playing good game, gives a thorough pass to Biraj Maharjan, powerless shot by Maharjan, goalie Izham catches the ball safely. Minutes 54: Rohit Chand is playing good game, gives a thorough pass to Biraj Maharjan, powerless shot by Maharjan, goalie Izham catches the ball safely. Minutes 57: Bhola Silwal is injured, medical team is rushed to the scene, he looks fine after spraying...! Nepal National Team 0 Malaysia Olympic team 0. Minutes 61: Anil Gurung is booked yellow card by referee. Unnecessary card, it was with the ball. Fandi kicks the ball, Rohit clears the ball from D-box. Minutes 63: Outstanding game by Rohit, blocks Nazmi in the left flank, Good cross from Chand to Santosh Sahukhala but Sahu is late to reach the ball. Minutes 64: Wow! Lovely defending game by Rohit Chand to Wan Zaharul almost beats the off side trap, and in one vs one but Rohit heads the ball out. lovely clearance. Minutes 70: Nepalese player are looking under pressure, Malaysia Olympic team is pressing hard for a goal. Minutes 74: Nazmi gives a quick pass to Issaq Farris, lovely pass but goalie Kiran Chemzong comes forward to save the ball. Good save by Chemzong. Minutes 81: GOAL..Malaysia scores a GOAL through header. Izaq Faris scores beautifully through header. Nepal goalie Kiran Chemzong tries to save the ball but in vain. Malaysia Olympic team 1 Nepal National team. Minutes 84: Powerful shot by Swayanjan from 30 yard, powerful shot, goalie Kiran Chemzong blocks the ball, he spills the ball but manages to catch the ball. Minutes 88: Nirajan Khadka OUT, Anil Ojha Is IN - Nepal. Minutes 90: Four minutes of added time. Corner kick to Malaysian team. Ohh hoooo GOAL!!!!!! Maradona style! Maoh Muslin gets booked for using hand to net the ball. Minutes 90+2' : GOAL..BAd luck! Biraj Maharjan fails to mark Young Kuong /scores beautifully, curling the ball, goalie Kiran Chemzong fails to read the ball. GOAL. Malaysia doubles the tally. Poor defensive game. Malaysia 2 Nepal 0. Minutes 90+4' :FULL TIME...Nepal National team loses the match 2-0 to Malaysia Olympic Side. Thanks for being us. Sorry admin balik magrib dan stay sampai isyak. Jurulatih kata kita boleh makan pasukan Nepal ini. boleh... dapat 2 gol.. jadilah..
Kawe tak tengok game ni, so susah nak komen. Harap2 mereka dapat improve dari segi ketahanan dan speed sbb dalam perlawanan dgn Jepun dulu, jelas mereka tak dapat bersaing langsung. 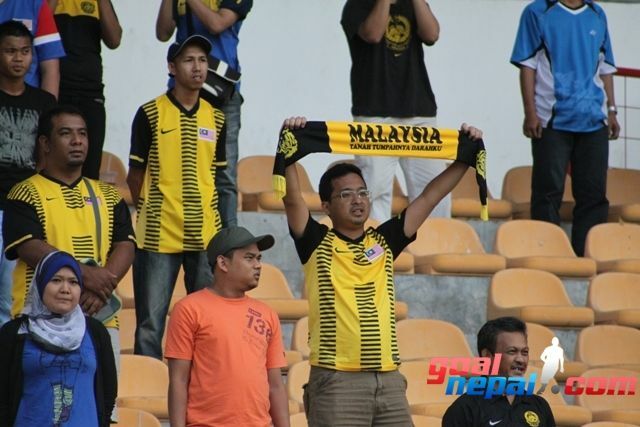 All the best Harimau Muda!